BPP is pleased to announce completion of the project at Brackenbury Grove, London W6. Citystyle Homes, the private sales arm for One Housing Group has now launched for sale a collection of mews houses, town houses and apartments at the Brackenbury Village, close to Hammersmith and Shepherd’s Bush. BPP’s team provided employer’s agent, cost consultancy and site inspector services on the project. BPP is delighted to announce its appointment by a new client, Wycombe Abbey School for provision of Construction Consultancy Services. The School has an impressive record of academic success and is consistently one of the top performers in public examination league tables. Wycombe Abbey girls gain admission to competitive courses at leading universities throughout the world. Set in magnificent conservation listed grounds spanning over more than 160 acres, Wycombe Abbey, offers its pupils a country lifestyle, whilst being located in the town of High Wycombe, Buckinghamshire. BPP is pleased to confirm appointment on the Poplar Harca Consultants Framework for Employer’s Agent. Poplar Harca has undertaken a large regeneration programme of existing stock over the past 6 years to bring its stock of circa 9,500 properties up to, and in many cases, above decent homes standards. Alongside the GLA and the Mayor of London, Poplar Harca’s aims are to create affordable housing, jobs, new green space, mixed inclusive community and a beautiful place to live. BPP looks forward to working with Poplar Harca on the above initiative. BPP hosted a Drinks Party to view a Photographic Exhibition on Thursday 19th May 2016 at The Grazing Goat. A photography exhibition was produced and presented by a group of nine talented photography students studying on an HND in Photography Programme at the London College of Contemporary Arts (LCCA). Celebrating the fourth year of the creative partnership between BPP and LCCA, a number of students were invited to creatively respond to the theme of “Construction”. The selected students had the chance to spend a day on a new BPP landmark development. The project selected was Brackenbury Grove being developed by Citystyle Homes in West London. The Brackenbury Grove development will provide 57 homes, consisting of 51 for private sale and six for shared ownership. The elegantly designed scheme features eight commercial spaces, car parking and bicycle storage facilities. Properties feature their own private balcony for residents to enjoy. The students photographed the site and produced unique, vibrant and often unexpected interpretations on the theme of Construction. Overall a successful evening with a good turnout, complimented by flavoursome food and drinks. Photographs by Marina Lobuneca, Tony Faulkner. For further selection view Brackenbury Photos by LCCA. BPP is pleased to confirm completion of the project at Tileman House. Tileman House is a collection of 12 contemporary one and two bedroom shared ownership apartments situated in Putney, SW15. Each apartment provides light-filled open-plan living space, a stylish kitchen, modern bathroom and high quality fixtures and fittings. Viridian has sold the apartments on a Shared Ownership tenure providing a step on the property ladder in an affordable way. BPP’s team provided site inspector services on the project. The site was secured by Hollybrook. BPP introduced the scheme to Hyde Group. The scheme comprises 30 residential units in a mix of flats and duplex apartments. The project was procured via a ‘golden brick’ arrangement under a development agreement. Kevin Frost, one of BPP’s senior associates, was involved with the drafting and agreement of the documentation. The site is located within the southern edge of the London Borough of Lewisham in an area defined as previously developed land. The scheme is being developed to LHDG standards. The heating and hot water are being supplied via individual gas boilers with the main source for renewables being roof mounted photo voltaic panels. The scheme will meet the renewable energy requirements for new homes. The development is an opportunity to develop a vacant site, repair the residential street urban grain with sustainable residential design and provide much needed additional housing. BPP is providing Employer’s Agent, Quantity Surveyor and Site Inspector services. BPP is hosting its annual Photographic Evening on Thursday on 19th May 2016. The event comprises a drinks evening along with an exhibition of photographs featuring a designated construction site. This year we’ve chosen Brackenbury Grove to feature in our exhibition. BPP is working with Citystyle Homes, part of One Housing Group in the development of Brackenbury Grove. The development will provide 57 homes, consisting of 51 for private sale and six for shared ownership. The elegantly designed scheme features eight commercial spaces, car parking and bicycle storage facilities. Properties feature their own private balcony for residents to enjoy. Invitations will be issued by early April 2016. The redevelopment of the Kidwells Estate in Maidenhead has created a landmark scheme. BPP worked on the redevelopment of Kidwells Estate with One Housing Group. The redevelopment was carried out over four phases with the work beginning in 2011. The scheme consists of seven individual three to four-storey blocks and includes 75 properties for rent to existing and new tenants, 9 shared ownership homes and 120 for private sale. The new homes are built to a high quality finish and specification and surrounded by well positioned communal areas, private amenity spaces and landscaped gardens. The tenure mix encourages a diverse residential community. The building materials were carefully selected to compliment the surrounding area as the estate shares a boundary with Kidwells Park. BPP provided Employer’s Agent, Site Inspector and CDM C/Principal Designer Services. Hallsville Quarter Phase 2 is in the London Borough of Newham opposite to the Canning Town station and bound to the north by the A13 highway. The overall GIA is 64,610 sqm. The development will consist of 3 residential apartment blocks and a hotel block. There are two levels of basement car park (294 no), the upper level of which connects with the Phase 1 car park. 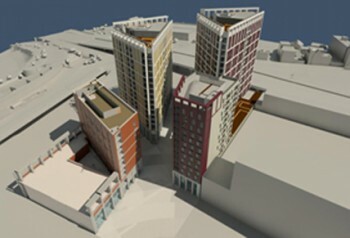 Citystyle Homes is working with Bouygues Development in developing a 13 storey block of flats comprising 55 units for Intermediate tenure. Citystyle Homes is the private development arm of One Housing Group. The project is procured via a Sales and Purchase Agreement.